It is an amazing way to attract customers and gain exposure. In this post, I’m going to teach you how to create a YouTube channel and get subscribers. Over 300 hours of video are uploaded to the platform every day, and it’s high time brands started taking full advantage of it. In this article, I’ll take you through a step-by-step guide to creating a successful YouTube channel. So take a seat in the director’s chair as we go through everything you need to know to create and build your own YouTube channel. No technical know-how needed here; YouTube makes it incredibly easy to set up your channel. First, sign into your YouTube account and click on the user icon at the top right of the screen. Choose “Account Settings” from the drop-down menu. Enter your brand name and click create. Now it’s time to enter your channel description. Like any other description or about page, you’ll want to describe your brand and what viewers can expect to see on your channel. Think of it as your elevator pitch – you want to give viewers all the information up front while making it intriguing enough to want more. You also want to take the opportunity to employ a little YouTube SEO. Because YouTube is basically a search engine for videos, your videos should be treated and optimized like any other piece of content you create. Start by selecting 1-2 keywords and researching it in Google Keyword Planner. Once decided, try to incorporate the keywords into your channel description. Next up is channel art, i.e. the giant banner that lives at the top of your channel homepage. The banner is generally the first thing people will see when they come to your channel, and it’s important that you choose a cover art that’s consistent with your brand. How do you present yourself on your website or marketing materials? Simple and clean, or funky and creative? Whatever your particular image is, stick with it. Your last creative effort here is your channel trailer. It’s a short and sweet way to introduce your channel and tell your audience what it’s all about (much like your channel description, only visual). This is your opportunity to make a killer first impression, so lead something (or someone) engaging. To set up your trailer, simply go into your account and click My Channel from the left hand menu. Under the channel’s banner, click the settings icon and toggle the customize the layout of your channel to “on”. Before the cameras start rolling, you need to have a gameplan. Remember, this is still a marketing channel, and you need to approach it with a marketing strategy in mind. So go back to basics. Who is your target audience? What are their goals, and what kind of content/videos do they need from you to achieve them? Once you know what your audience needs to hear, decide how what form you can deliver in. Some fields will be able more obvious others. For example, food bloggers can easily produce video recipe tutorials and reviews. Others, like financial advisors or real estate agents, will have to stretch into specific strategies like “how-to save for retirement or first home buyer tips”. Entertain or Accomplish – Your video needs to accomplish at least one of these. Quality Always Comes First – We’re talking superficial here. This refers specifically to looks – your video needs to look professional. Neil sites two examples: the classic white background, and the whiteboard video. Make a Name for Yourself: This means you must commit to regularly uploading videos to your channel. More videos means more subscribers and viewers, and eventually a bigger name. And remember, attention spans are short these days. Keeping your video under 5 minutes (optimal time: 2 minutes, according to a Hubspot report) will generate the most engagement. Good news: The hard part’s over – uploading couldn’t be easier. You can upload either through your browser or the YouTube app. For your browser, just log into your account and click the Upload button in the top right corner. Click the button to upload your video and choose your privacy settings. While your video uploads, you’ll be taken to the Basic Info screen. Here, you’ll enter in your video title, description, and any tags. This is where SEO comes back into play. Just like with the channel description, you’ll want to choose 1-2 keywords that fit your video (and rank well), and incorporate them into your title and description. Tags are another area to pay attention to. When applied correctly, the can lead to a higher rank in YouTube searches and more frequent appearances in Suggested Videos. These will be a mix of default tags and video-specific tags. Channel keywords – channel names, individual names, etc. Once your description and tags are in place, you’ll be taken to a Languages screen where you can select any languages you would like your video translated into. Next is the Advanced settings screen, where you’ll select your settings for things like comments, categories, etc. Press publish, and voila – you’ve created a YouTube video. So you’ve created and published your video. Now it’s time to advertise. Luckily, advertising on YouTube is highly effective. Pretty impressive numbers. And you can make them work for you. 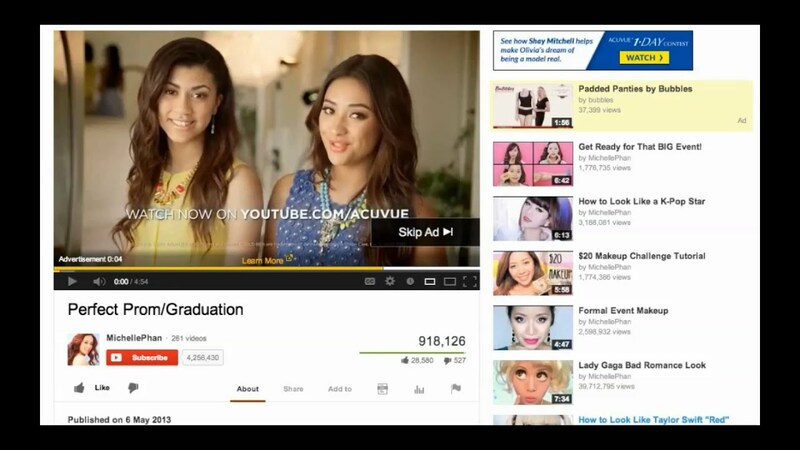 YouTube offers three types of ads: True-View InStream ads, TrueView Discovery ads and bumper ads. When considering how to create your YouTube channel, make sure you note you must invest in YouTube ads. Ultimately the ad format you choose will depend on your individual business goals. When in doubt? Experiment with each of them. For a more in-depth look at advertising on YouTube, take a look at my ultimate guide. As with any marketing initiative, the promotion will make or break your channel. The rule of thumb? Spend as much time promoting your content as you did creating it. Here are a few tried and true methods to increase your YouTube traffic. If you’re using YouTube, it’s a safe bet you’re active on other media channels as well. So cross-promote like crazy. Share links to your video on your Facebook, Twitter, Instagram, etc. Use email marketing to include new videos in your newsletters or updates. Ask readers to subscribe to your channel, and even include a link to your channel in your email signature. Create a blog post to go alongside your video, or simply put your video in its own post. Either way, promoting through your blog is a powerful way to reach potential customers and represents another opportunity to rank through SEO. This may not strike you as immediately important, but a well-chosen thumbnail will help catch users’ attention and send them to your video. Want more subscribers? Tell your viewers that. While it may seem too easy, CTA’s are extremely effective. Want to be popular on YouTube? You have to put in some community work. Actively engage with your audience. Reply to comments and answer questions. If they know they’ll get a response, users will be more likely to interact. Don’t forget to reciprocate. Find other relevant channels to subscribe to and make an effort to leave your own comments. A great way to involve your audience is to base a video on what they specifically want to know. So ask them. Have your viewers send in questions, and dedicate a video to answering them. Not only will give you content you know is valuable to your audience, but it will show your audience that you’re engaged with them as well. Should I enable my channel for monetization? YouTube recently released an update that made it a requirement that channels be part of YouTube’s Partner Program in order to include external links in their videos. For businesses, that means they would have to join the Program (which enables monetization) if they wanted to use links to their website, landing pages, etc. In light of the change, it makes sense to enable monetization, ad YouTube seems to favor monetized videos and gives your channel access to helpful features like the use of end screen cards. Should I shoot my own videos or hire a production company? This ultimately comes down to how much time and money you’re prepared to invest in your channel. The important thing to remember when just beginning is that the emphasis should be on quality video content; it’s okay to keep the production simple. A Smartphone can get the job done, and as your channel grows you may want to purchase additional recording equipment. Or, if you have the resources available, experts can be brought it to ensure the highest quality videos from the beginning. How do I come with video ideas? Generating content ideas will be a similar process to how you brainstorm blog ideas. Once you’ve decided what direction and approach you would like to take with your channel, take a look at your existing content to see which has been the most successful. Also pay attention to your competitor’s channels and the kind of content that works for them. Always remember to keep your content relevant to your audience and consistent with your other marketing channels. Should I allow comments on my videos? While a negative comment or two is inevitable, it shouldn’t scare you away from enabling them. Encouraging users to comment is a great way to build engagement and provide timely feedback. Remember to respond consistently to comments to help build a community, and keep in mind that you can delete any comments that appear spammy or inappropriate. Should I start multiple channels, or just one? If your company sells a variety of different products or services, you may benefit from creating separate channels tailored to each one. Now You Know How To Create A YouTube Channel – Questions? With all this on hand, you’re ready to start creating your own channel. Remember, most of the work happens before you ever log into YouTube. First, know your audience and what’s relevant to them. Then, create and upload away. After that, it’s a matter of advertising and promotion to ensure your channel is a success. How is your YouTube channel going? Ask questions or comment below.